George Inness (May 1, 1825 – August 3, 1894) was an influential  Inness is best known for these mature works that not only exemplified the Tonalist movement but also displayed an original and uniquely American style. George Inness was born in Newburgh, New York. He was the fifth of thirteen children born to John William Inness, a farmer, and his wife, Clarissa Baldwin. His family moved to Newark, New Jersey when he was about five years of age. In 1839 he studied for several months with an itinerant painter, John Jesse Barker. In his teens, Inness worked as a map engraver in New York City. During this time he attracted the attention of French landscape painter Régis François Gignoux, with whom he subsequently studied. Throughout the mid-1840s he also attended classes at the National Academy of Design, and studied the work of Hudson River School artists Thomas Cole and Asher Durand; "If," Inness later recalled thinking, "these two can be combined, I will try." He debuted his work at the National Academy in 1844. 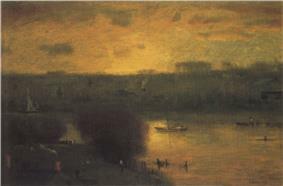 Inness opened his first studio in New York in 1848. In 1849, he married Delia Miller, who died a few months later. The next year he married Elizabeth Abigail Hart, with whom he would have six children. In 1851 a patron named Ogden Haggerty sponsored Inness' first trip to Europe to paint and study. 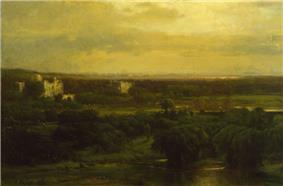 Inness spent fifteen months in National Academy of Design as an Associate member and became a full Academician in 1868. During trips to Paris in the early 1850s, Inness came under the influence of artists working in the George Inness, Jr., who also became a landscape painter of note, was born in Paris. In the mid-1850s, Inness was commissioned by the Delaware, Lackawanna and Western Railroad to create paintings which documented the progress of DLWRR's growth in early Industrial America. The Lackawanna Valley, painted ca. 1855, represents the railroad's first roundhouse at Scranton, Pennsylvania, and integrates technology and wilderness within an observed landscape; in time, not only would Inness shun the industrial presence in favor of bucolic or agrarian subjects, but he would produce much of his mature work in the studio, drawing on his visual memory to produce scenes that were often inspired by specific places, yet increasingly concerned with formal considerations. Lake Albano, 1869. Phillips Collection. Inness moved from New York City to Medfield, Massachusetts in 1860, where he converted a barn into a studio. In 1862-63, he was an art teacher to Charles Dormon Robinson. He then to Eagleswood, New Jersey in 1864. He returned to Europe in the spring of 1870, living in Rome and touring Tivoli, Lake Albano, and Venice. In 1878, he returned to New York, taking a studio in the New York University Building. The same year, he also participated in the Universal Exposition in Paris, and published art criticism in the New York Evening Post and Harper's New Monthly Magazine. His work of the 1860s and 1870s often tended toward the panoramic and picturesque, topped by cloud-laden and threatening skies, and included views of his native country (Autumn Oaks, 1878, Metropolitan Museum of Art; Catskill Mountains, 1870, Art Institute of Chicago), as well as scenes inspired by numerous travels overseas, especially to Italy and France (The Monk, 1873, Addison Gallery of American Art; Etretat, 1875, Wadsworth Atheneum). In terms of composition, precision of drawing, and the emotive use of color, these paintings placed Inness among the best and most successful landscape painters in America. Inness was the subject of a major retrospective in 1884, organized by the American Art Association, which brought him acclaim in the United States. He earned international fame when he received a gold medal at the 1889 Paris Exposition. After Inness settled in Montclair, New Jersey in 1885, and particularly in the last decade of his life, this mystical component manifested in his art through a more abstracted handling of shapes, softened edges, and saturated color (October, 1886, Los Angeles County Museum of Art), a profound and dramatic juxtaposition of sky and earth (Early Autumn, Montclair, 1888, Montclair Art Museum), an emphasis on the intimate landscape view (Sunset in the Woods, 1891, Corcoran Gallery of Art), and an increasingly personal, spontaneous, and often violent handling of paint. It is this last quality in particular which distinguishes Inness from those painters of like sympathies who are characterized as Luminists. In a published interview, Inness maintained that "The true use of art is, first, to cultivate the artist's own spiritual nature." His abiding interest in spiritual and emotional considerations did not preclude Inness from undertaking a scientific study of color, nor a mathematical, structural approach to composition: "The poetic quality is not obtained by eschewing any truths of fact or of Nature...Poetry is the vision of reality." Inness died in 1894 at Bridge of Allan in Scotland. According to his son, he was viewing the sunset, when he threw up his hands into the air and exclaimed, "My God! oh, how beautiful! ", fell to the ground, and died minutes later. A public funeral for Inness was held at the National Academy of Design, and a memorial exhibition was conducted at the Fine Arts Building in New York City. ^ "George Inness, the Famous American Tonalist Painter". Retrieved 9 July 2012. ^ "George Inness: Private Treasures". Montclair Art Museum. Retrieved 9 July 2012. ^ "MAM and Adult School of Montclair - George Inness After Hours Tour". The Jersey Tomato Press. Retrieved 9 July 2012. ^ Bell 2003, p. 151. ^ Bell 2003, p. 152. ^ Cikovsky, Nicolai: George Inness, page 74. Harper & Row, Publishers, Inc., 1985. In Cikovsky's estimation, " This painting is undoubtably not only the finest of Inness' early paintings; it is also one of the finest he ever painted." ^ Cikovsky, page 154, 1985. ^ Harper, Franklin (1913). Who's who on the Pacific Coast: a biographical compilation of notable living contemporaries west of the Rocky Mountains (Public domain ed.). Harper Pub. Co. pp. 483–. Retrieved 29 January 2012. ^ In 1899, several years after Inness' death, a small landscape, Gray, Lowery Day, 1877, sold for over $10,000. Cikovsky, page 142, 1985. ^ Taylor, E. I. The Interior Landscape: William James and George Inness on Art from a Swedenborgian Point of View, Archives of American Art Journal (Smithsonian Institution), 1997. 1&2, 2-10. ^ "Montclair Art Museum Gallery Will Be Dedicated to Works by George Inness", Montclair Art Museum. Accessed June 4, 2008. "George Inness settled in Montclair, New Jersey in 1885, living and working there until his death in 1894." ^ "The energy of his attack upon a canvas (in this case it was literally an attack), the rapidity and accuracy of his drawing and brushwork and the amount of space he would cover in a few moments, was simply marvelous to watch". Account of Arthur Turnbull Hill, Bell 2003, p. 46. ^ As early as 1871, in Old Aqueduct, Camapagna, Rome, his powers of suggestion are already evident, as described in this unique passage: "In this landscape painting, he used the virtuosic brushstroke not so much to represent sheep as to present to his viewers the ontological essence of sheep." Bell 2003, p. 138. ^ Bell, page 37, 2004. ^ "A Painter on Painting", Harper's New Monthly Magazine 56, page 461. February 1878. ^ "You can only achieve something if you have an ambition so powerful as to forget yourself, or if you are up on the science of your art. If a man can be an eternal God when he is outside, then he is all right; if not, he must fall back on science." Cikovsky, page 136, 1985. ^ Bell, page 28, 2004. ^ Cikovsky, page 182, 1985. ^ Bell, page 64, 2004. Sterling and Francine Clark Art Institute 2008 exhibition "Like Breath on Glass: Whistler, Inness, and the Art of Painting Softly." Documenting the Gilded Age: New York City Exhibitions at the Turn of the 20th Century. A New York Art Resources Consortium project. Exhibition catalogs, a biographical description, and an essay by Thomas Kirby on Inness.